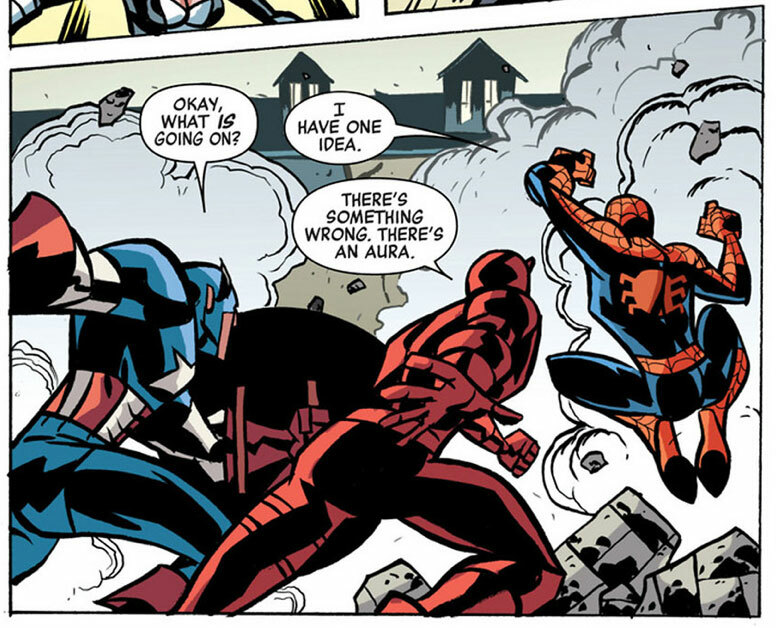 Daredevil's Wacky Power #21 – Auras! If you’ve been following this series of posts, you may remember that Matt once had the ability to sense people’s “auras.” We’re not talking about purple, sparkling halos or anything (as far as I know), but whatever it is villains radiate to make them come across as villainous. Apparently it’s like a gaydar for sniffing out criminal masterminds or random psychos. There’s something wrong. There’s an aura. I don’t know what this aura is supposed to be. Maybe it’s the same kind of energy that Spider-Man’s spider sense taps into. Maybe Bendis is just making this up as he goes along. Maybe Matt feels he has to impress his fellow Avengers. Either way, I do find the contrast between what Bendis says the radar sense is (a combination of Daredevil’s four remaining heightened senses, making it – in theory – the most naturlistic option available to any Daredevil creator), and what Daredevil actually ends up doing on the page to be pretty extreme. Check back Monday for The Other Murdock Papers Podcast #4, which features a very special guest in the form of none other than Chris Samnne! It’s part interview with the guy who – holy crap! – draws Daredevil every month and part just geeking out with a fellow fan. I hope you’ll enjoy it!